One of the more popular trends coming out of Toy Fair this year is rotocast figures. These figures are called that due to the manufacturing process used. Most action figures are cast by forcing plastic into a steel mold, completing filling the mold under pressure. Rotocast figures are done slightly differently - plastic is put into the mold but it's not completely filled. Instead, the old is spun very quickly, and the centrifugal force forces the plastic into the details of the mold. This produces a hollow toy, rather than solid plastic. Advantages to this are pretty obvious - the figure is lighter weight (very good for large size figures like this) and cheaper due to using less plastic. In the past, the major downside has been that it was much more difficult to produce figures with extreme amounts of detail. Forcing the plastic into tiny areas with centrifugal force just doesn't produce the same results as forcing it in under pressure. That seems to be changing, and the new rotocast toys are getting better and better. Toybiz just gave us the large size Hulk figures in this style, and now they are producing a series for the new X-Men 2 movie. Shipping right now is Wolverine, and Nightcrawler (reviewed here). This packaging is as basic as it comes. There's some decent text on the back giving a general outline of the movie plot, and a few pictures of the movie version of Nightcrawler. Still, the box is predominately meant to simply keep the figure from tumbling off the shelf. It's actually somewhat collector friendly though, in the sense that you could take the figure off the box and return it later if you really felt the need, all without too much effort or any damage. 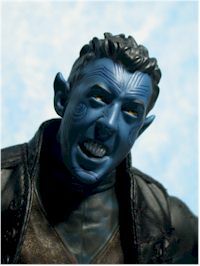 Now keep in mind that I'm guessing a bit here, since I have only seen the stills and the short preview of the movie that has the Nightcrawler in it, but it looks like they've done a very good job capturing the likeness from the film. I'm impressed with the level of quality of this figure, and there's more detail in the sculpting than I had expected. The face is very well done, and all the wrinkles and textures in the clothes are there as well. The pants are a bit plain, but the paint ops are meant to make up for it. The paint ops are decent, but certainly not above average. 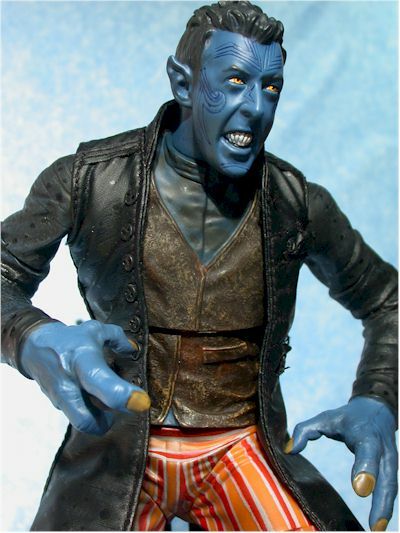 While the blue face was consistent, the white teeth are sloppy, and the lines of the pants are very hit or miss. Some look great, and others look pretty poor. The hair line is also a bit uneven, with some over spray onto the face. The color choices are good though, although they are (or should be) dictated by the film. His outfit is certainly eye catching, and makes a nice break from the basic black that I expect we'll see with the other characters. I wanted to point out that the color of the face, hands and tail looks off in the photos to me - it's much more obviously blue in real life. Of course, I'm color blind as hell, so it might look blue in these photos too, and the blue background may just be throwing me off! 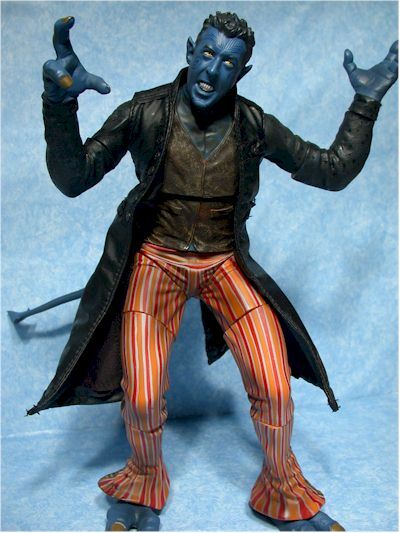 Nightcrawler has neck, ball jointed shoulders, cut biceps, wrists, chest, waist, hips, cut thighs, tail and ankles. The ball jointed shoulders have somewhat of a restricted range of motion, but overall this is quite a bit of articulation for this style of figure. Sure, this isn't your usual 12" figure, with a cloth uniform and highly articulated body, but the price point reflects that. Speaking of the tail, I wish it had been a more bendy rubber. It is somewhat bendy, but is made of a fairly rigid plastic. You can manage to position it in a few different ways, but you'll have to heat it and cool it to really do much with it. I'm sure he could have had SOMETHING, and this is really the only area that's going to hurt the overall score. I suspect that by going without accessories, they are able to keep the cost down, and avoid having more complicated packaging. It would be necessary to protect any accessory to avoid theft, so this style of basic box wouldn't have worked. Yes, technically he has an outfit, since the part of his coat that covers his body is cloth. It's well stitched, although not lined, and they've done a much better than usual job of blending the cloth jacket into the sculpted arms. But the big plus here for the coat is the wire they've placed through the bottom seam. 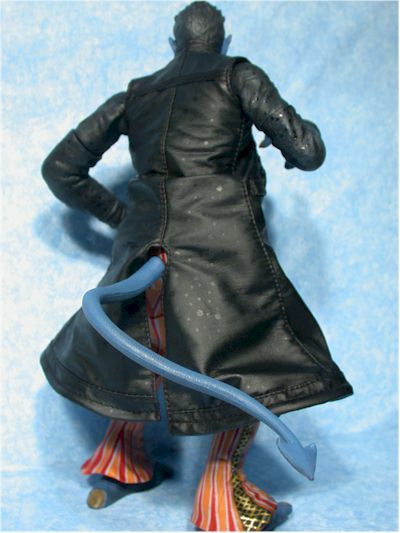 That means you can pose the bottom of the coat in various ways, giving him a much more dynamic appearance. Nice touch! This figure is a fantastic value, considering he's only ten bucks. 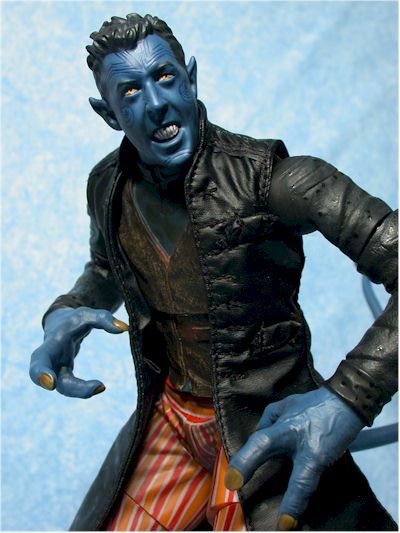 You're getting a good looking 12" scale version of Nightcrawler, with decent paint ops and articulation, all for the price of one much smaller 7"-8" figure from most other companies. This is almost a ***1/2 star figure - all that's holding it back is the lack of any accessories. If they threw in one, along with slightly better paint ops, this figure could have easily reached four stars. Still, if you're an X-men fan, pick it up. It's a simply terrific value, and looks great on the shelf. Now that we have the Hulk in this style (although not really in scale), along with the X-men 2 figures, it opens up a whole 'nother scale to put together in a display! - Entertainment Earth has them listed by the case. 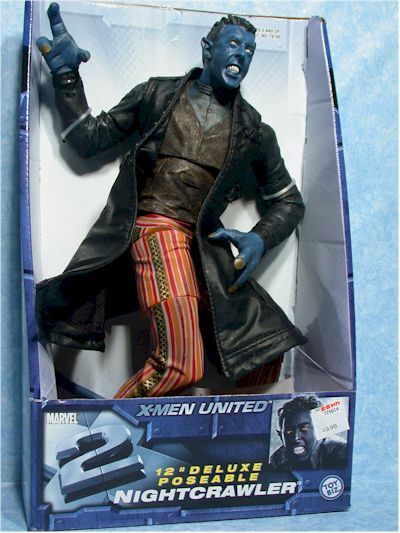 You'll probably get three Wolverines and one Nightcrawler for $40 plus shipping.